Creativity is inherent in us all... each of us just needs to find the right medium of expression for it! I strive to make ceramics as an art form, accessible, convenient and fun. 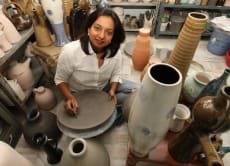 I teach in a niche art company - focused on pottery and ceramics. We work to increase knowledge of ceramics, encourage appreciation and improve accessibility of this art form.